One of my first big a-ha moments when it came to audio gear was upgrading to a significant power conditioner. 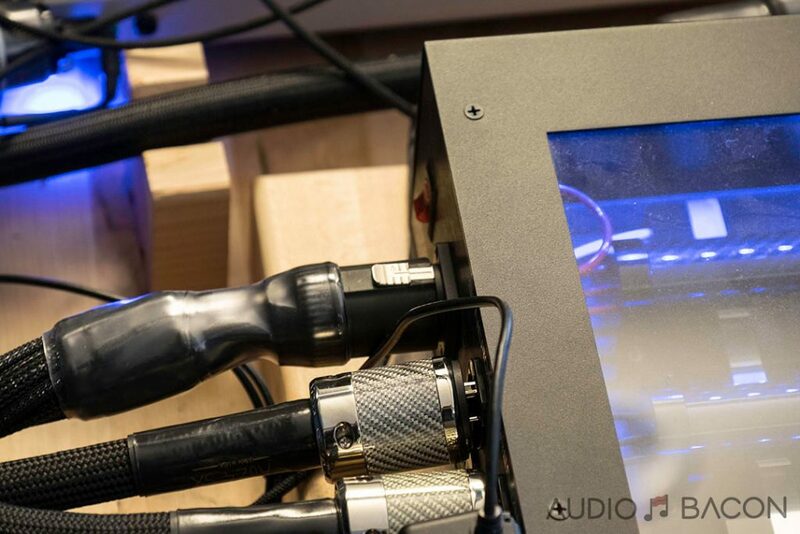 I noticed a small difference in my first unit — the PS Audio Dectet, but when upgrading to a PS Audio Power Plant P10 Regenerator, it changed my world. It was a thoroughly upgrade across the board for the entire system. Since then, I’ve toyed around with the High Fidelity MC6, balanced power via the Equitech 2Q, and now, the Synergistic Research Powercell 12 UEF SE. I was mixed with excitement and a bit of trepidation in anticipation of hearing this power conditioner. Trepidation because of the large price tag, and concern for our wallets. But excitement because we’ve been really impressed with what we’ve seen with their power cables and active ground blocks. A note about power conditioner technology. There are a lot of methodologies and approaches to getting clean power. Some use a ton of noise suppression clean up the noise, others use magnetic conduction to “focus” the flow at a molecular level, while others blow it up entirely by regenerating their own clean sine wave. 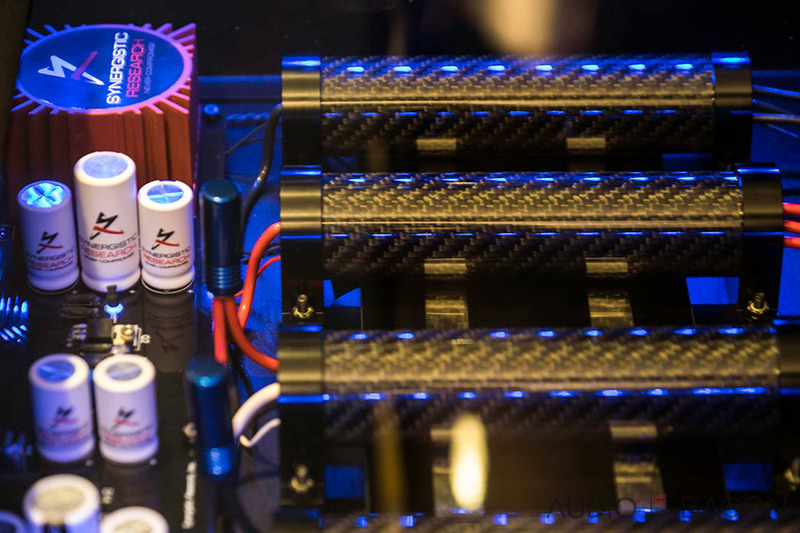 We’ve also seen balanced power technology advocated by some manufacturers, and here we have Synergistic Research with their own litany of technologies. We take a relatively neutral stance with regards to technology. Even though we’ve studied electrical engineering in college, we’ve also no longer practice it for our day jobs. It’s something like to hear about and get some understanding, but it’s not our job to take apart theories. At the end of the day, we listen, and listen, and listen, and report our observations and notes to the best of our abilities. 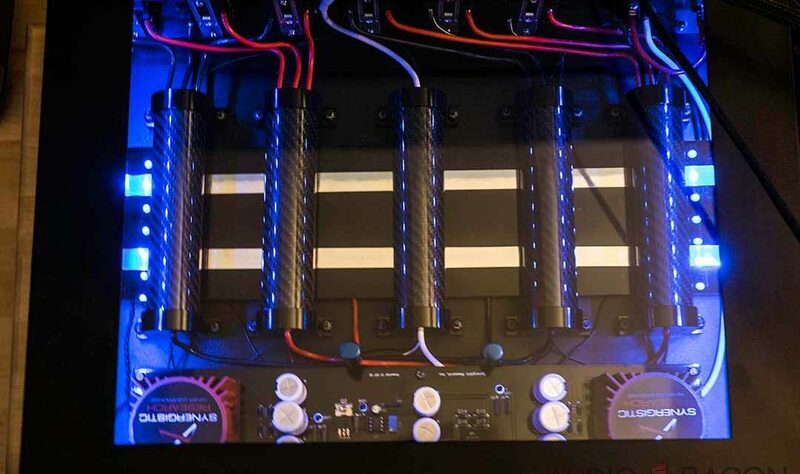 Unlike most other power conditioners, this the PC12 UEF SE is a full package. It’ll contain a modified Level 3 Atmosphere Power Cable. It’s modified to use the lower noise Neutrik PowerCON 32A connector. You can read details of that power cable here. It’ll also use an SR Quantum Black Outlet. This outlet really needs about 2 weeks to really settle and break in. It’ll have its ups and downs. As a result, it’s important to evaluate the system as a whole as opposed to its individual parts. We did break it up a little for the sake of this review and we’ll detail into that later. While each outlet is individually isolated, but also further isolated into two banks. It’s suggested that you keep your digital gear on one back and your analog gear on the second bank. It’ll take your unit 2-3 days to bias up and break in a bit. You’ll notice a change, but it may sound closed off and will need time to open up. While we heard some of the good merits of the power conditioner, there were things we didn’t necessarily like so much pre-break in. It’ll really kick into gear about 5 days of running. You can hook up a small appliance like a fan and let it run for a few days. I had my router / NAS, and TV & Apple TV running on it. Unlike other conditioners that have giant transformers, this guy is relatively light. Don’t let that mistake you for its capability though! Light in such a way that stiff power cables coming out of it may make it tricky to hold the conditioner in place. Also, note that feature wise… do note the device does not have a circuit breaker or surge protection. Some devices do, some don’t, and some may find that important and some do not. Our setup is the same as the Active Ground Block SE review; but for comparison sakes, both of us listened to the PS Audio Power Plant P10 & The High Fidelity Cables MC-6 Hemisphere. In all scenarios, a single High Fidelity Cables MC-0.5 was plugged into the same duplex as the associated power conditioner. Note: The unit has 10 outlets, a circuit breaker, and comes with a standard power cable. This particular unit was upgraded with a Synergistic Research Blue Fuse. 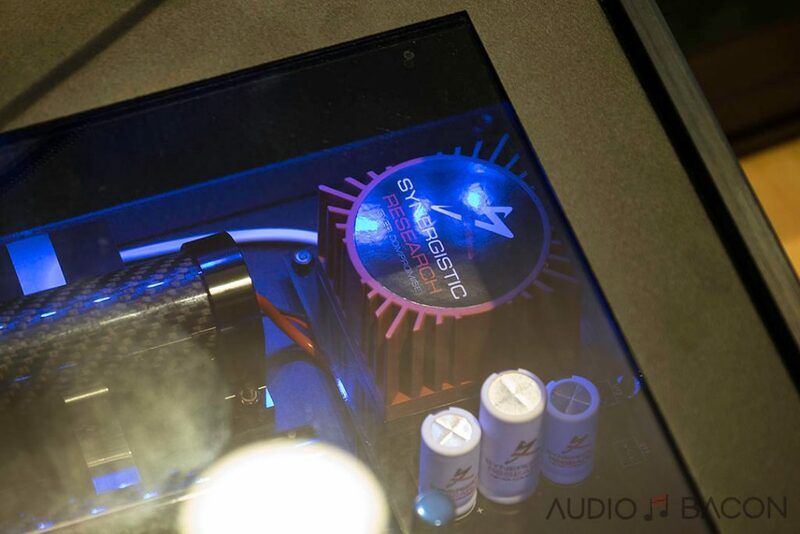 For testing purposes, our original reference cable, the Synergistic Research Atmosphere Level 3 HC cable was used. Note this unit has only six outlets, no protection of any kind as well, and does not include the power cable. 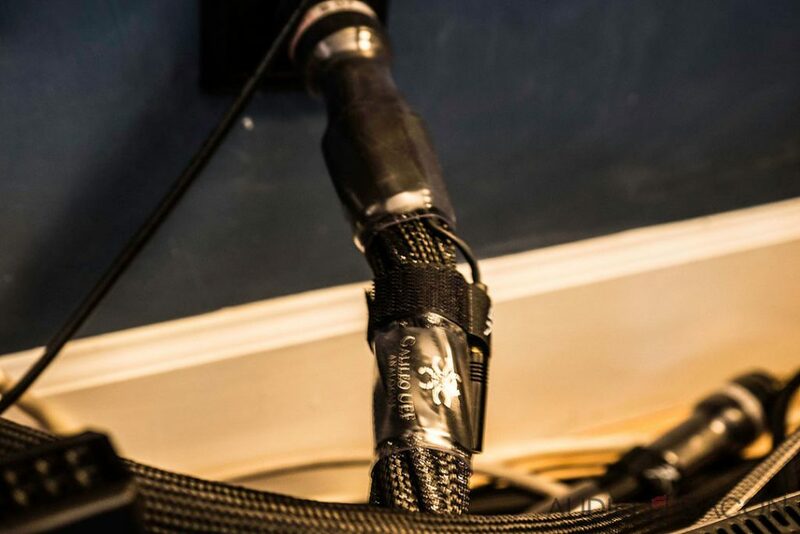 For testing purposes, our original reference cable, the Synergistic Research Atmosphere Level 3 HC cable was used. Power: Shunyata Research Alpha Ztron HC power cable. Synergistic Research Active Ground Block: Not grounded to power conditioner in all scenarios. Not recommended for PowerCell 12 UEF SE, and no grounding screw available for the HFC MC-6 Hemisphere (screws are filed down). 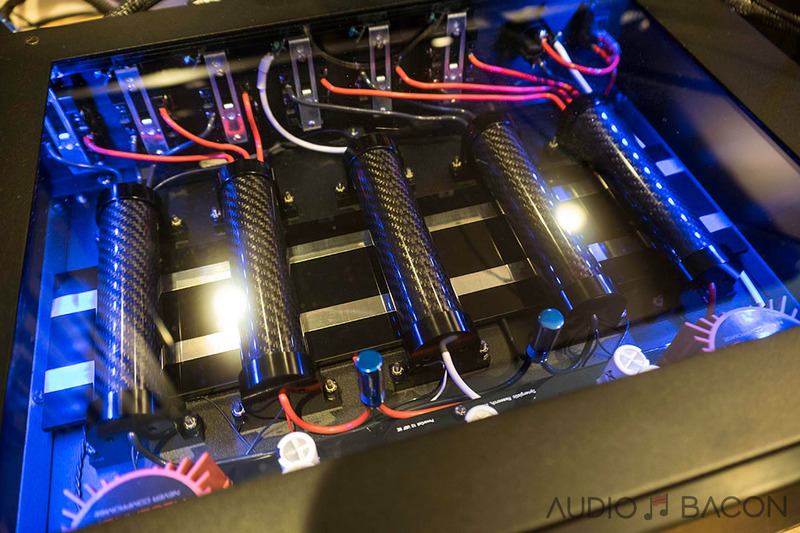 PS Audio’s P10 does not have an explicit grounding post, but can be grounded via chassis screws underneath the unit, and does have a noticeable positive impact. 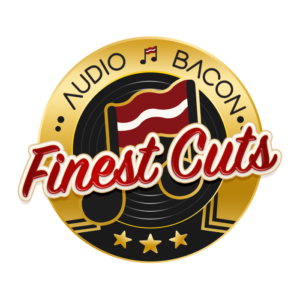 For the purposes of this review; we did all our listening with the Furutech GTX-D (R) outlet. We did not install the SR Quantum Black outlet. 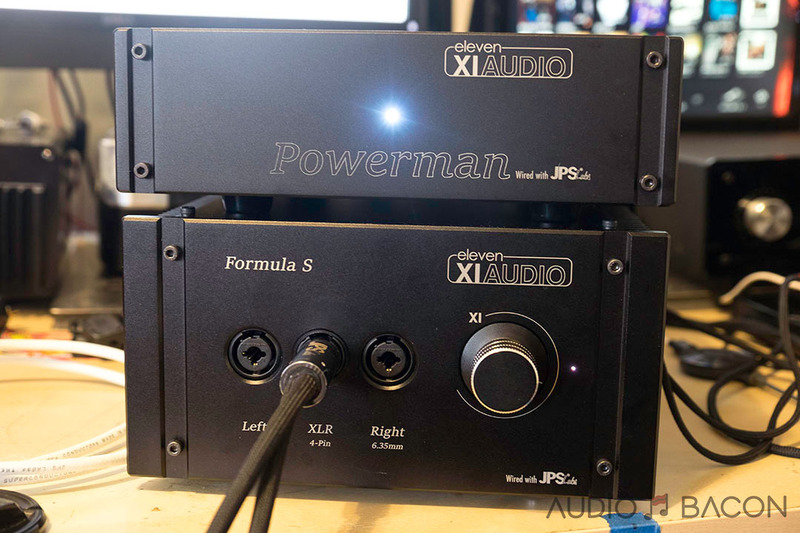 We did install it after, give it a 2 week break in (as suggested by Synergistic Research), and then did a quick comparison between the two outlets on the PC 12 UEF SE. This was one listening test that Jay and I have been most excited to try out for a couple of reasons. The price point was a huge interest. As noted, If you account for the fact that the $6,495 price tag actually contains $3,495 power cord and $249 outlet, you’re really looking at a $2,750 power conditioner. That perspective really points you to a near 1:1 price point with the HFC MC-6, and potentially a bargain compared to our reference $4,999 Power Plant P10. Additionally, we’re also comparing three very different levels of technology. One based on a complete regeneration of the power sine wave, one based on proprietary magnetic conduction technology, and the PowerCell 12 UEF SE based on an entire arsenal of proprietary technology. 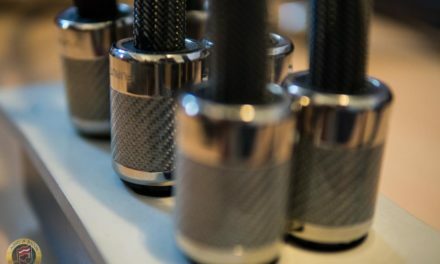 Lastly, between the MC-0.5 in our reference setup and the SR Atmosphere Level 3 used, we felt like we had a baseline of tech mix and isolated the influence of the power cable to the conditioner (which we strongly feel plays a huge role in the character of your system as a whole). After selecting some reference tracks for the review, we cycled through the Powercell 12 UEF SE, Power Plant P10, and the MC-6 Hemisphere once. Wow. Sanity check by cycling again in reverse order. Wow again. 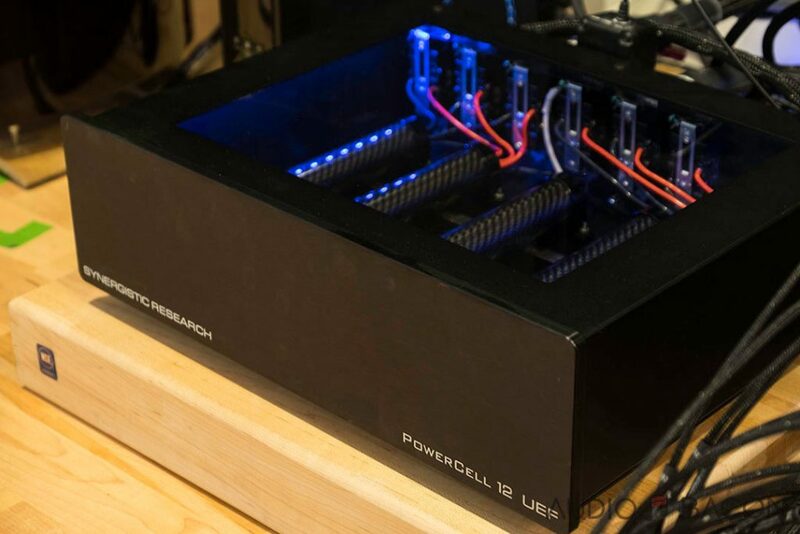 The Synergistic Research Powercell 12 UEF SE blew our mind. We were dumbfounded by the significant resolution we gained without losing much of warmth and body we previously had. The noise floor was at a level we had not heard in this system before. There was a sense of physical space and dimension that really stood out. Let’s get to the listening notes and then discuss some of these points. 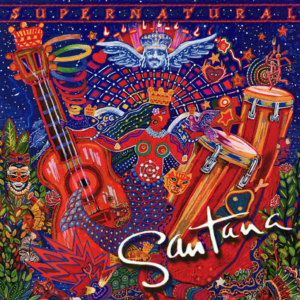 Santana – El Farol (96/24): We love the feeling of the rifts from Santana and the details of how all the instruments come together. I need a cocktail to go with this – like a solid good old fashioned. 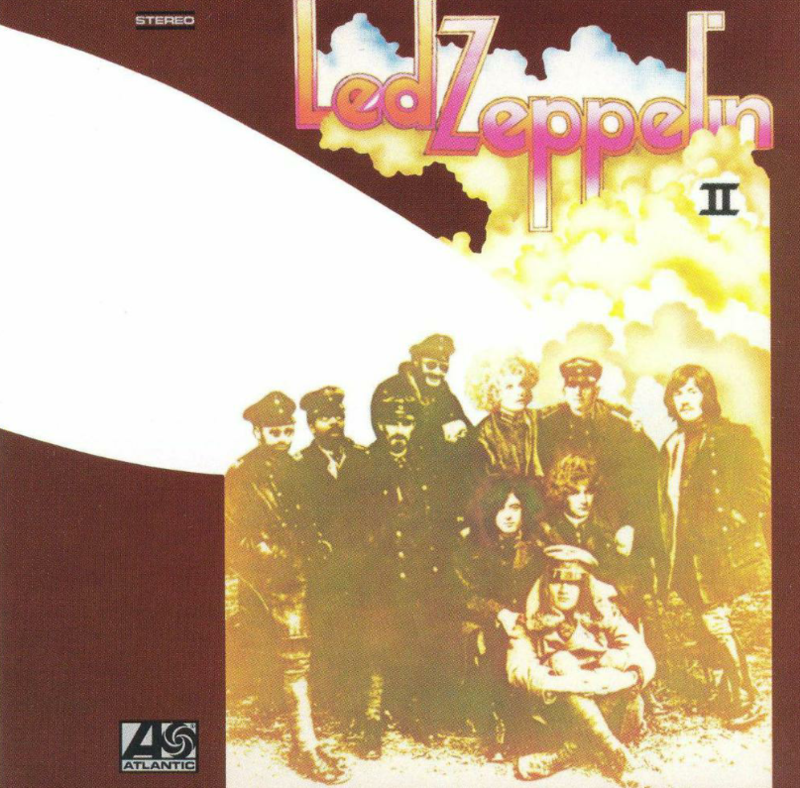 PC12 UEF SE: The dynamics on from bass notes with the electric guitar rift early on the song really stood out. The separation of the horn sound and the guitar was also very evident about 30 seconds in. There’s this detail of a “scraping” sound that goes from left to right about a minute in that is incredibly detailed and smooth in it’s transition from one side of the soundstage to the other. It really feels like the speaker disappears there. The vivid nature of the PC12 UEF SE is really apparent here. What’s unmatched in this demo song is the resolution that the Synergistic Research Powercell 12 UEF SE brings. It’s at a head and shoulders level over the other two units here. To be honest, I didn’t think I could extract more resolution without upgrading the other major components in my system. I also thought it would sacrifice some level of warmth and musicality, but that was not the case here at all. P10 + SR Level 3: There’s good separation in the horn and guitar, but a little less depth. The scrap effect felt a little thinner. The P10 has a musicality that I like, it was apparent in the horn’s lively and realistic nature. Having the HD ground on the P10 gave it more air, dynamics, and accuracy in imaging. HFC + SR Level 3: That aforementioned scrap doesn’t seem to really have the same flow as the PC12 UEF SE. It’s more discrete in hearing the left speaker, then the right speaker. It almost comes off fuzzier than a noted individual effect on the song. Overall, it was also noticeable that there was less resolution in this setup. It doesn’t layer out the music or provide nearly as much air as the PC12. That said, one might consider the HFC MC-6 a little more natural and organic sounding in its ease minus the resolution and air. Led Zepplin – Whole Lotta Love (96/24): Love the atmospherics of this song. It’s an absolute head trip and one where you can pick our various details to listen to for days. PC12 UEF SE: The zipping of the vehicle around the race track still rings in my head. The manner in which you feel like you’re really in the middle of this track with things zipping around you was particularly impressive. 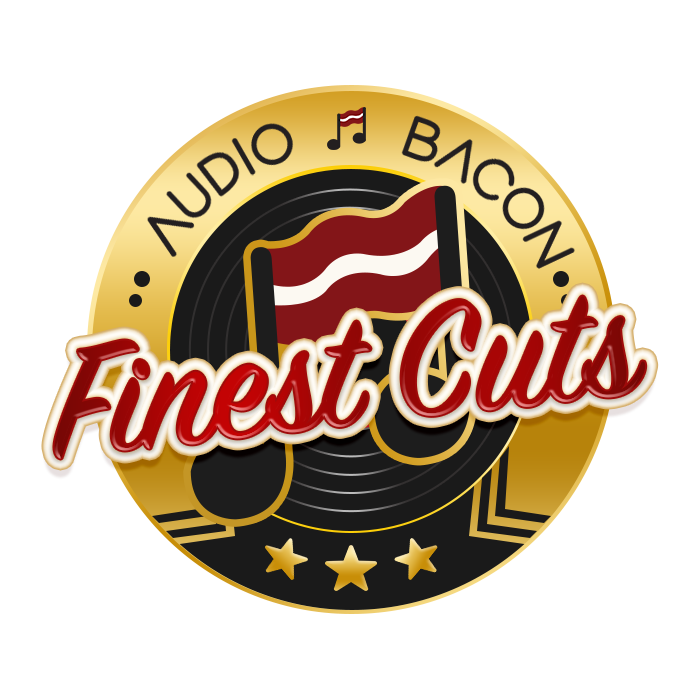 It was the surround sound nature of it, the linearity and continuity of the track that was outstanding. You might even be fooled into thinking we had some form of a five channel setup. The cymbals in the track were so fun to listen to. You can really hear the impact and reverb/decay of the cymbal as it expels the energy of the strike. The way each of the “loves” echoes later on the song really shows off the ability of the power conditioner to separate out the details. P10 + SR Level 3: The way the race cars zooms around is very smooth, but has a little less grunt in the vrooms; and doesn’t seem to reach the back of your head quite as much. The impact on the strike of the cymbals really hit home as well, but the reverb doesn’t seem to linger with as much detail. Again, the placement of instruments and locations are right albeit a little more splashy and less focused. HFC + SR Level 3: The detail is there, but the depth isn’t quite there. It feels like the width of the track collapsed about 2 feet or so. Additionally, the continuity of the track seems a bit more discrete in hearing a left speaker and a right speaker. The cymbals seem to be a bit lighter and with less authority though you do hear the reverb. The PC12 is much more atmospheric, more eerie, and more enthralling. The MC-6 has a more “grounded” sound. Admittedly, voices do sound quite nice with this combination but wish it had the clarity of the PC12. 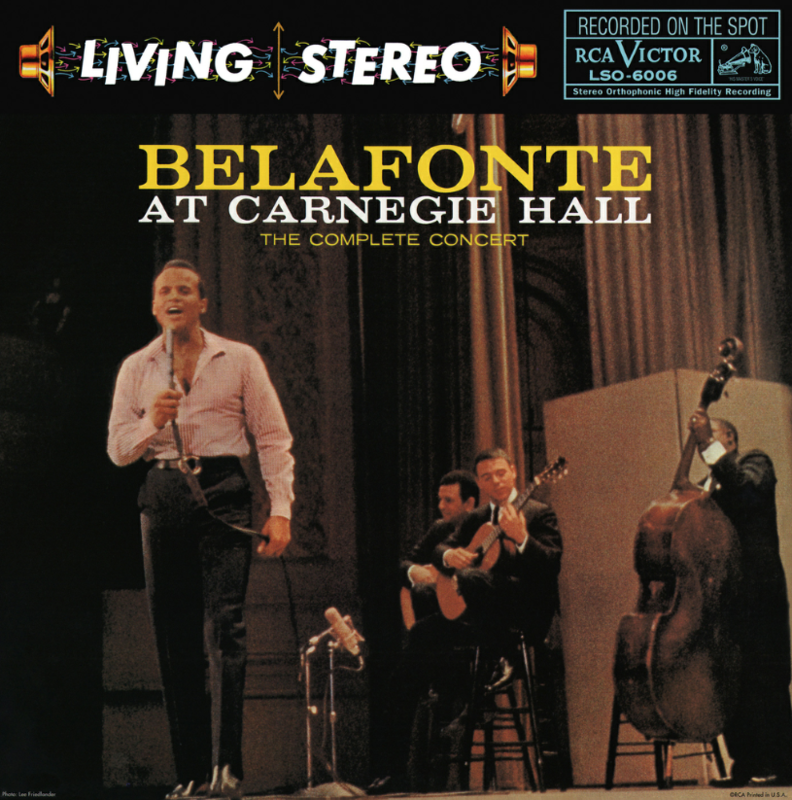 Harry Belafonte – Banana Boat Song (Day O) (DSD64): Great song to test male vocals as well as imaging/separation capabilities (the background singers & crowd). PC12 UEF SE: The musicality and soul of Harry’s voice really shines here. What’s particularly notable with PC12 UEF SE is how you can really visualize each of the backup singers, standing in this diagonal line formation from the front left corner of the stage towards the center / back part of the stage. That level of detail, placement, and separation between each of the backup singers voices was something we hadn’t previously experienced. There’s also a liveliness to the bonga player in the far right that was really entertaining here too. 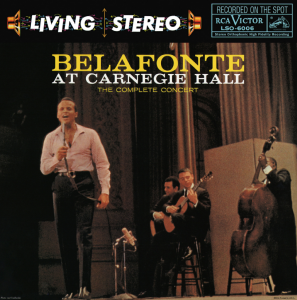 The rhymic drums are also palpable while exuding a freedom of acoustic reverberation into the room. This resolution and transparency is something the other two conditioners can’t come close to. It gives that “you’re in the venue” feeling. P10 + SR Level 3: There was less depth and focus to the background singers. They sounded more like one group as opposed to separate harmonizing individuals. There was also less separation from between the stage and the audience. We liked the energy and rumble on the bonga, and a smoothness to Harry’s voice. The MC-6 sounded a little meatier than the other conditioners but the other two have more a more airy character. HFC + SR Level 3: Nowhere near as quiet vs the PC12. While there was less depth and the stage seem to feel about a foot more narrow each side, we did note the vocals seem more youthful. The coughing from the audience sounds quite convincing. With the flatter stage, it seems like the backup singers were standing on a flat line parallel to the stage/crowd as opposed to that diagonal leaning formation. Interestingly, the bonga player seems to have faded back and come off a bit shy sounding and more of a background note than an individual band member. The MC-6 can’t compete on detail, precision, soundstage, or layering but does sound more warm-bloodied overall. 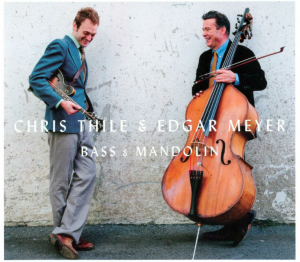 Chris Thile & Edgar Meyer – Tarnation (44/16): The strings on this track are so fun to listen to. The deep rumble of the bass and the light-footed mandolin really shows off the dynamics of a system. PC12 UEF SE: What really stood out is the finger work on the strings. The music dances and the soundstage is large. You can really visualize individual nature of the instruments facing off each other. The dynamics shows off really nicely. The rate and pace of the reverb & decay are really fluid and something that really pops out at you. There are lots of beautiful stringy textures on the cello and the fingerwork is made very apparent. This track also demos how quiet the PC12 is. P10 + SR Level 3: There’s good decay on the strings, it carried well. The bass seems to go a tad deeper, but there’s less sense of control. The resolution isn’t as apparent as the PC12 UEF SE, but the sense of placement is very good with pretty good air on the higher notes. HFC + SR Level 3: The two instruments didn’t seem to have as much separation and space between each other. While there’s good weight and heaviness to the bass, it sounds a tad bloated and flatter. The reverb and decay on the strings seem a little less linear and kinds of drop off a little bit. The MC-6 was meatier than the others but had a more rolled-off treble than both P10 and PC12. PC12 UEF SE: Guitar plucks are very tactile, smooth, and well-defined. Finger glides are easily visualized in front of the listening room. Female vocals are delicate and properly positioned in the soundstage. You haven’t heard black backgrounds until you have one of these PC12s in your room. It made the other two sound greyish and a bit smeared. Not as warm sounding as the other two but very pristine, clean, relentlessly focused, and just has this resolution that gives it life. P10 + SR Level 3: Doesn’t have nearly as much focus or detail as the PC12. There are noticeably less texture and dimension. No comparisons here. HFC + SR Level 3: Doesn’t have the shine or tactility of the PC12. Definitely sounds more closed-in but warmer and denser. The PC12 has the right amount of excitement without being fatiguing. While we did not do a formal comparison that included the Equi=tech 2Q, our previous experience puts it slightly behind the P10 in our preferences. It’s highly transparent and dynamic but lacked a bit of the muscle and musicality that the P10 enjoyed. And though this comparison did not include the SR black outlet, we later did some supplemental listening after an extended break in for the outlet and was surprised how much better the PC12 UEF SE performed on that outlet. More body and meat came from it, and it seems to expand on the qualities we observed by another degree. I really do believe that it’s absolutely vital to have a solid infrastructure in order for the unit to perform optimally. By that, I mean do everything you can to have your own circuit with at least 10 ga on that run. MSB technology has a really good article on this. In general, we liked the system more with the gold bullet attached. Update (6/15/18): We recently upgraded to the Galileo UEF power cord (from the Level 3) on the PowerCell 12 UEF SE. Imparts a nice vividness. The Level 3 is a bit dull in comparison. Way smoother. This is probably the most obvious attribute. The stock cable has more scratchy grain and edge in comparison. 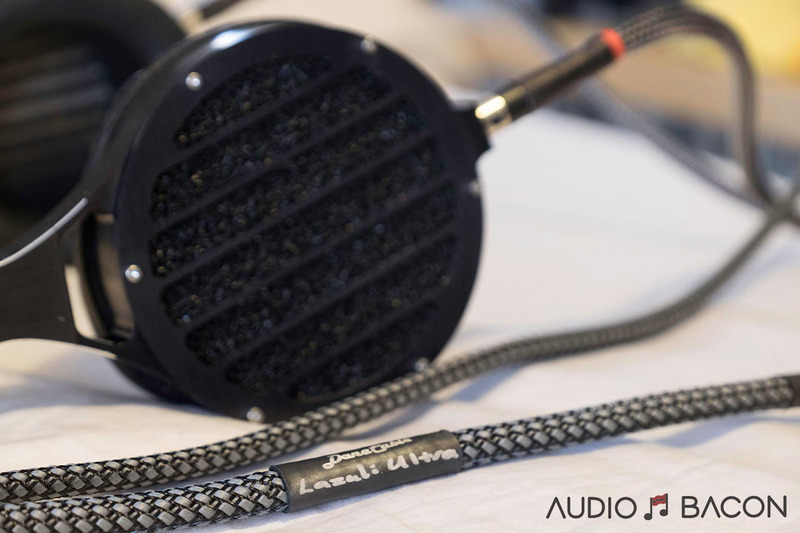 There’s more elasticity in the sound while the Level 3 cord is more rigid and diffused. 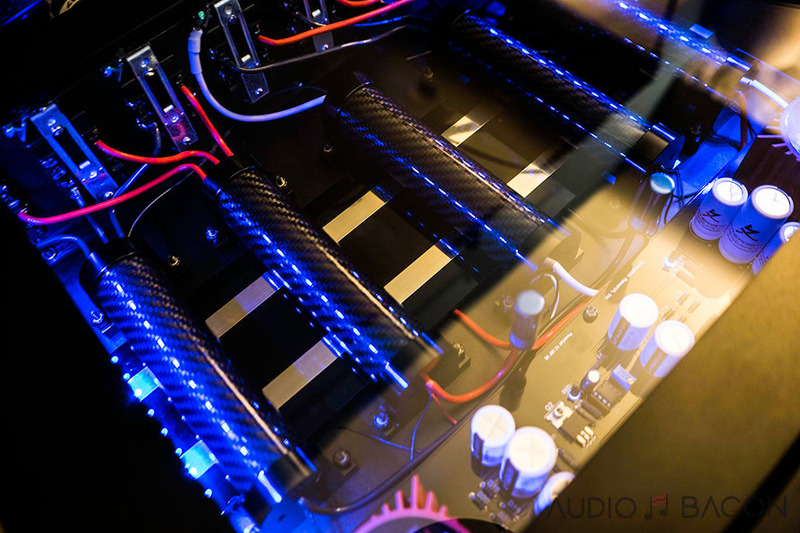 The Synergistic Research PowerCell 12 UEF SE is the quietest and most transparent power conditioner we’ve ever heard. As a consequence, micro/macro details are in full view without losing cohesion, texture, and body. You basically hear more of the music without losing musicality. 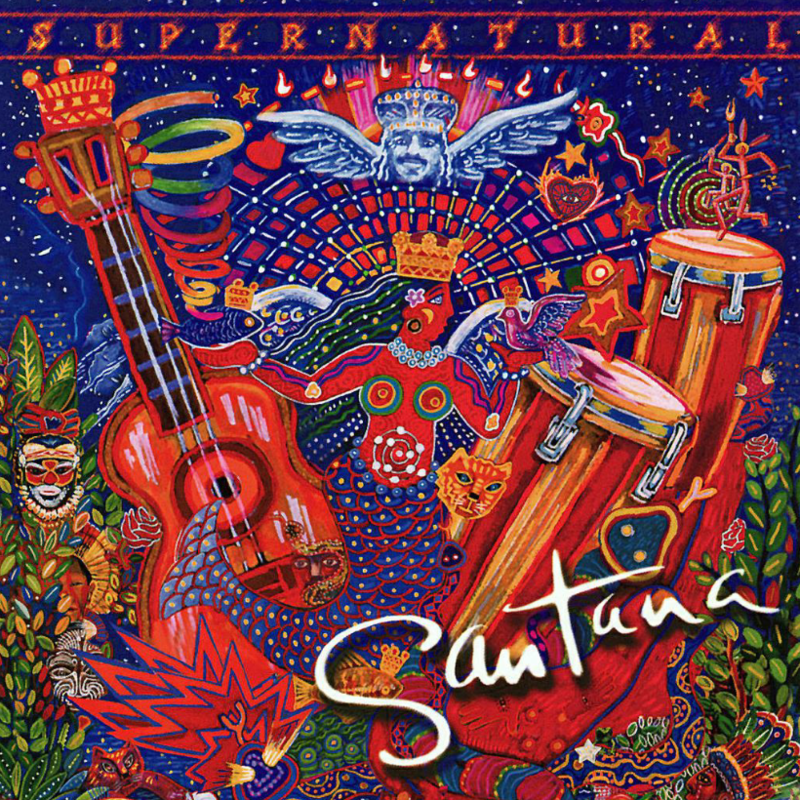 It provided a new level of clarity, insight, dynamics, and authority while being smooth and euphoric. It is simply an enthralling piece of gear, inside and out. A lot of times, you can debate between similarly priced units and see merits of it working well based on tastes and systems as a whole. While there may be minute details you might nitpick for the PC12 UEF SE, the unit’s ability to power your system with such resolution & musicality on a large soundstage against an absolutely black background is overwhelming. 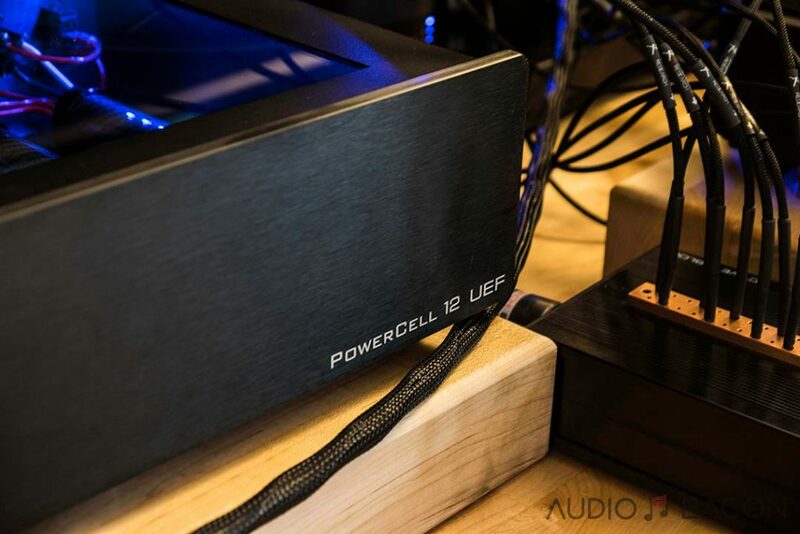 Between the performance and considering the accessories one usually has to dress up a standalone power conditioner (expensive power cords and outlets), the Synergistic Research PowerCell 12 UEF SE becomes an economically attractive proposition. One thing to note, we thought the SR Atmosphere UEF Level 3 power cord complemented the sound of the PS Audio P10 and HFC MC-6 Hemisphere better than the other cords we had on hand. 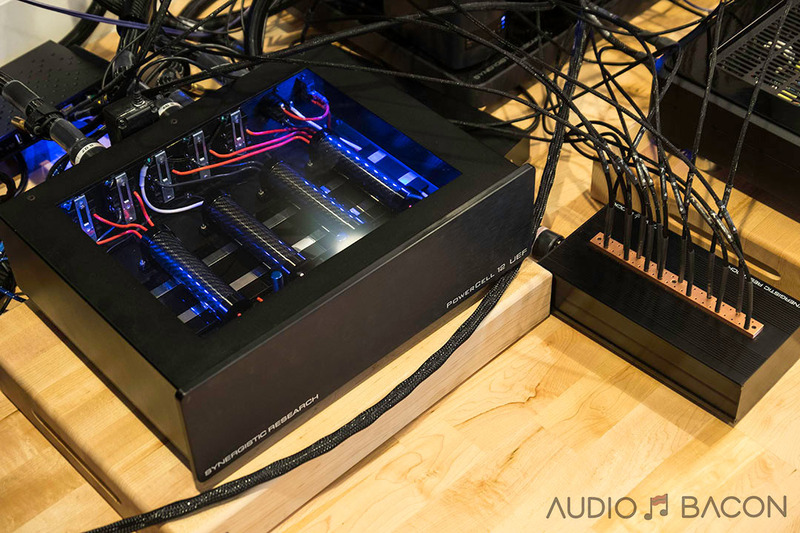 After spending weeks with the Synergistic PowerCell 12 UEF SE power conditioner, we decided to keep it as part of our B&W reference review system. THREE AND A HALF THOUSAND DOLLARS FOR A CABLE! ARE YOU MAD? Why is it, non of this very exspensive stuff has a UL listed sticker? Would love to hear your notes on the combination of both as opposed to one individual. We considered that as an experiment but ultimately decided against it as it would essentially put you into an entire another price category of power conditioners. I own a PS Audio P10 and have a SR Powercell 12 UEF coming. I didn’t think of trying what you did by plugging the SR into the P10. Specifically what did you hear when you had the powercell plugged into the P10 and what did you hear in comparison to to each used separately. Also uwhat gear did you have plugged into the powercell? Thanks. Can you share your experience with regards to comparing the PC12 vs PSAusio P10?